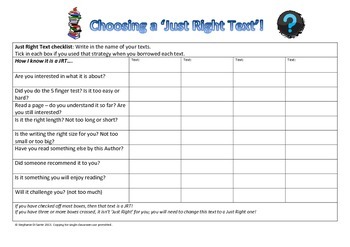 This clear and simple checklist helps students to choose 'Just Right Texts' to read during Independent Reading time and in your daily Reading hour or workshop. It is important that students choose texts to read that are ‘just right’ for them. Often, students will pick books that are too easy, too hard or they are not interested in. This checklist helps students to develop good strategies for choosing texts to read that are suited to them in ability and interest. 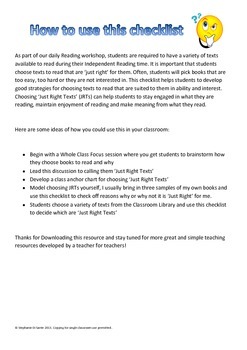 Choosing ‘Just Right Texts’ (JRTs) can help students to stay engaged in what they are reading, maintain enjoyment of reading and make meaning from what they read. Includes 'How to use this Checklist' which lists some lesson ideas and uses for this resource.